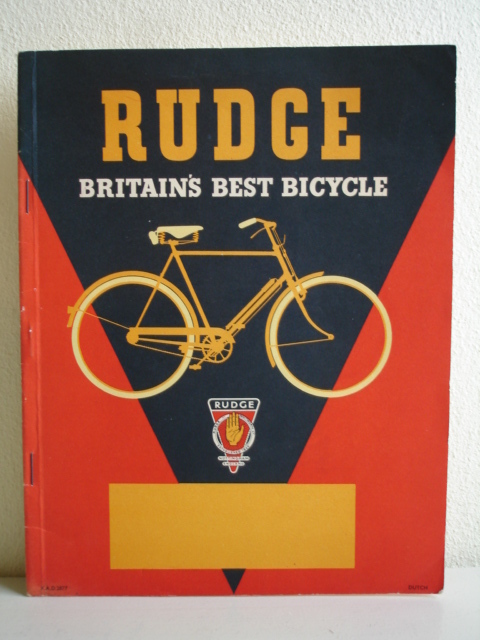 Title: Rudge, Britain's best bicycle. Description: Nottingham; n.d. (ca. 1957); Rudge & Whitworth; softcover, stapled; trade catalogue; prospectus, for the Dutch market, Dutch-language text; ills. in colour and b&w, of bikes and its parts; loosely inserted a price-list; backcover with an aerial view of Raleigh industries, the world's largest and most modern cycle plant; n.pp. (26 p.)Corners of cover and leaves with a few small folds.